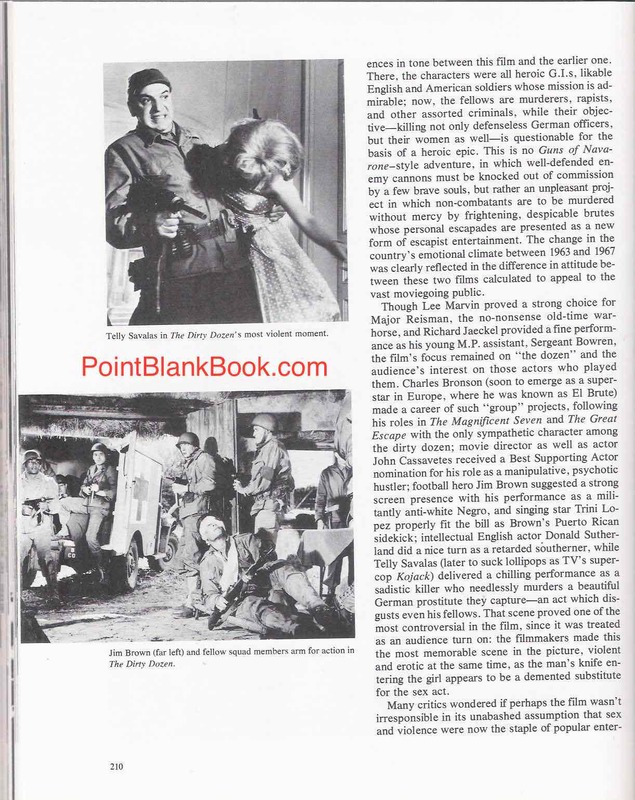 Long gone, the publishing company Citadel Press put out a series of books known as “The Films Of..” which focused on actors, genres, directors and decades, with The Films of The Sixties being a prime example. Written by Douglas Brode and published in 1980, it contains a series of essays chosen by the author in chapters broken down by each year within the decade. Brode was one of the better writers in Citadel’s stable and his insight into a given film is highly perceptive. That’s the good news about this title. The bad news is in the amount of information he got wrong, either by misinformation or by omission. 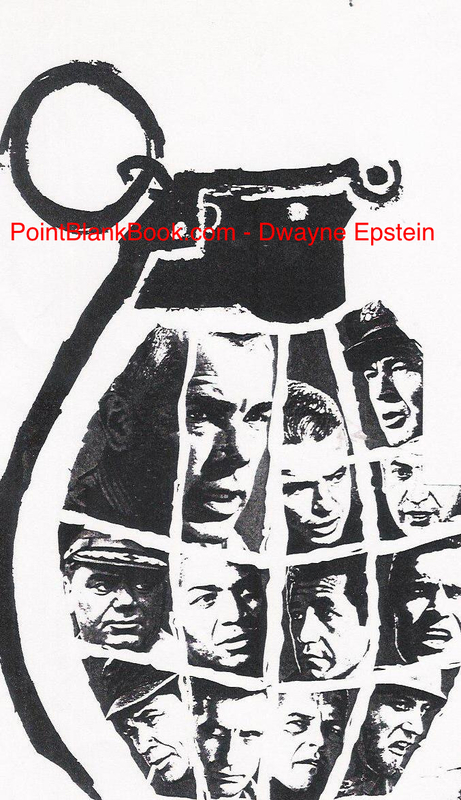 By omission it can be stated that he includes only two Lee Marvin films in his assessment, The Professionals and The Dirty Dozen. 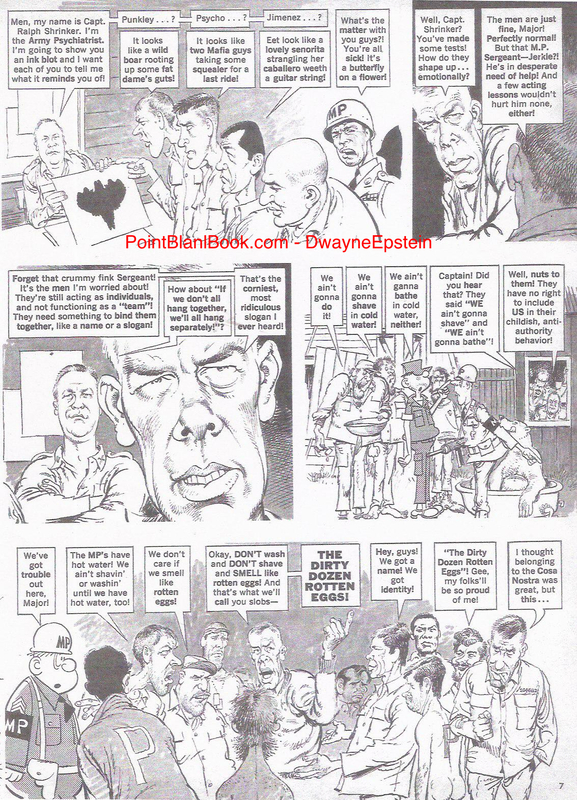 Since the book came out in 1980, the cult status and influence of Point Blank was well enough established to have been included in the book, as well as several others. 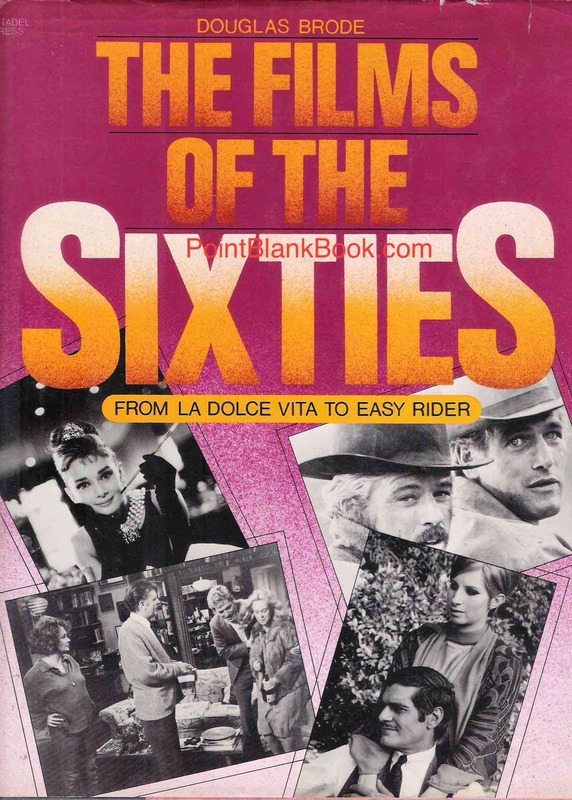 The cover of the Citadel Press book, THE FILMS OF THE SIXTIES by Douglas Brode. 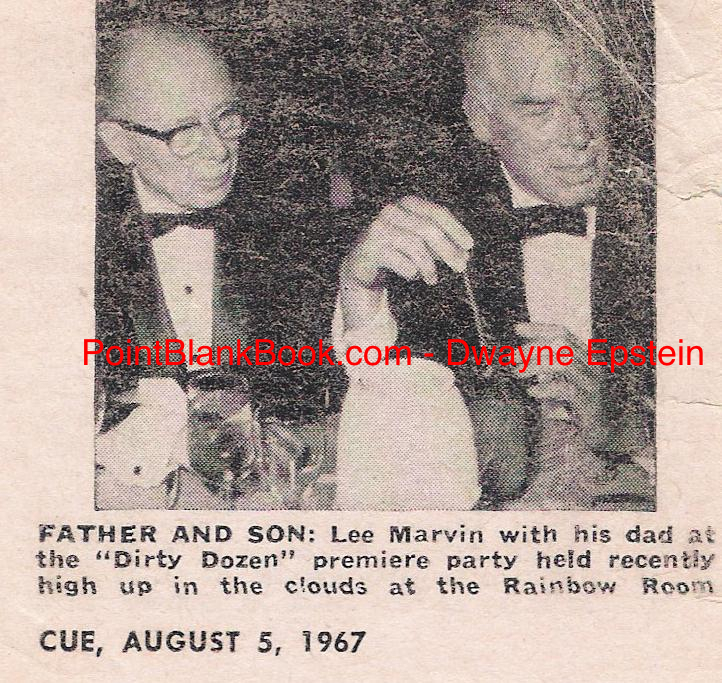 When researching Lee Marvin Point Blank, I perused all available sources but was left wanting by Brode’s essay on the film. Why, you may ask? Well, the essay is below but here’s what to look for in terms of what went wrong. -Donald Sutherland may be complimented to be referred to as intellectual but he’s certainly not English. He was born and raised in Canada and his character, Vernon Pinkley is neither Southern nor retarded. Slow-witted maybe, but his standout scene inspecting Robert Ryan’s troops shows him to be anything but retarded. 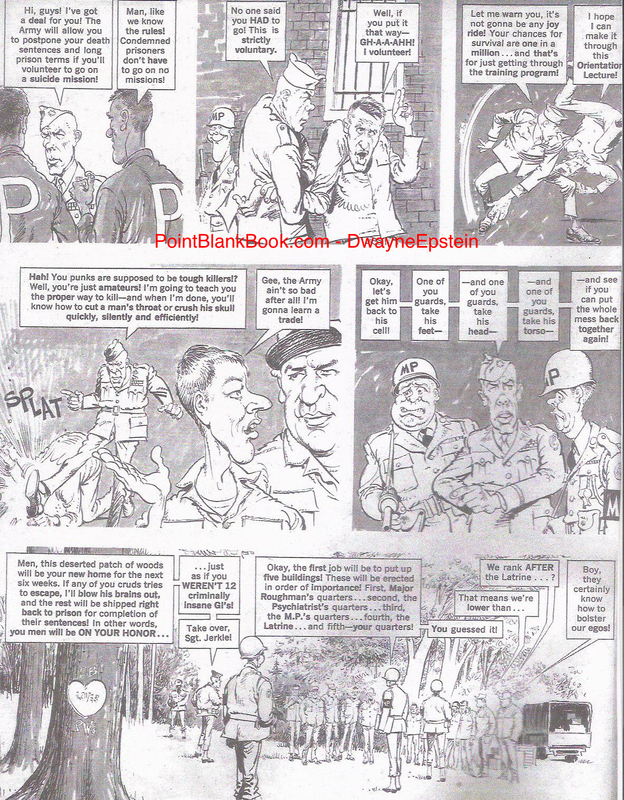 – Jim Brown’s character of R.T. Jefferson (Napoleon White in the novel) has good reason to be anti-white but Trini Lopez was certainly not his character’s Puerto Rican sidekick. 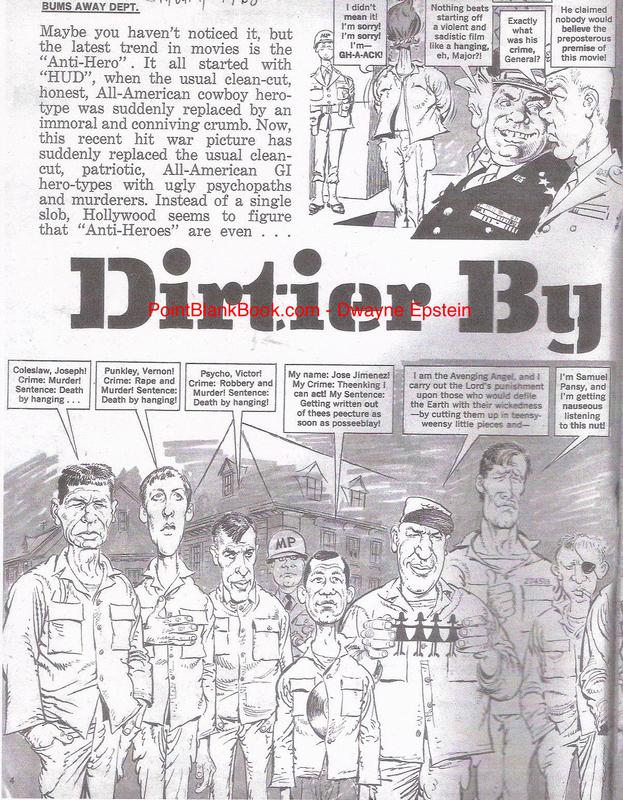 Brown’s sidekick in the film is clearly Charles Bronson’s character. – Although it’s a point that’s open to interpretation, Maggot’s murder of the young German girl is hardly on par with the inceneration of German officers and their civilian female counterparts. 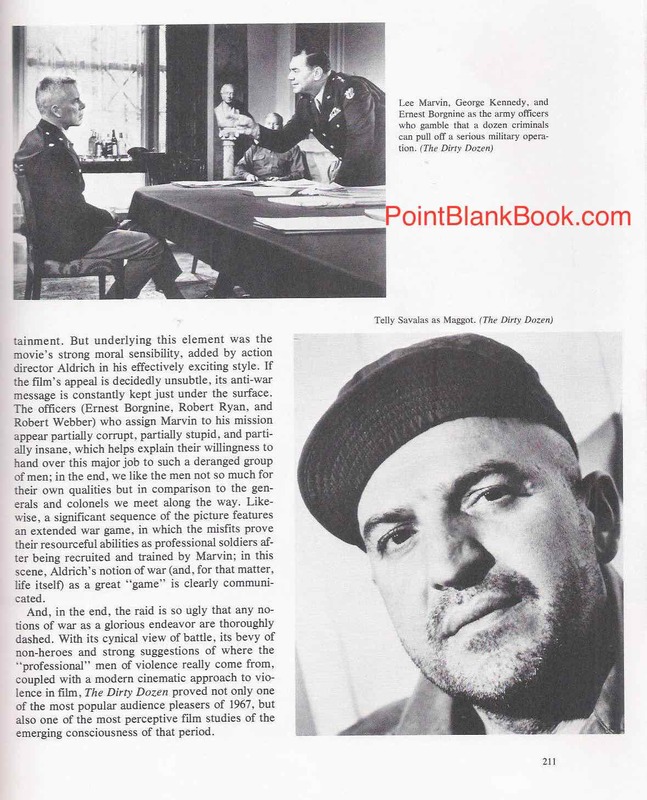 – The author even misspelled Telly Savalas’ TV alter ego, Theo Kojak. Oy! His overall assessment of the film and its importance is on the money, but the wince-inducing mistakes left me cold. 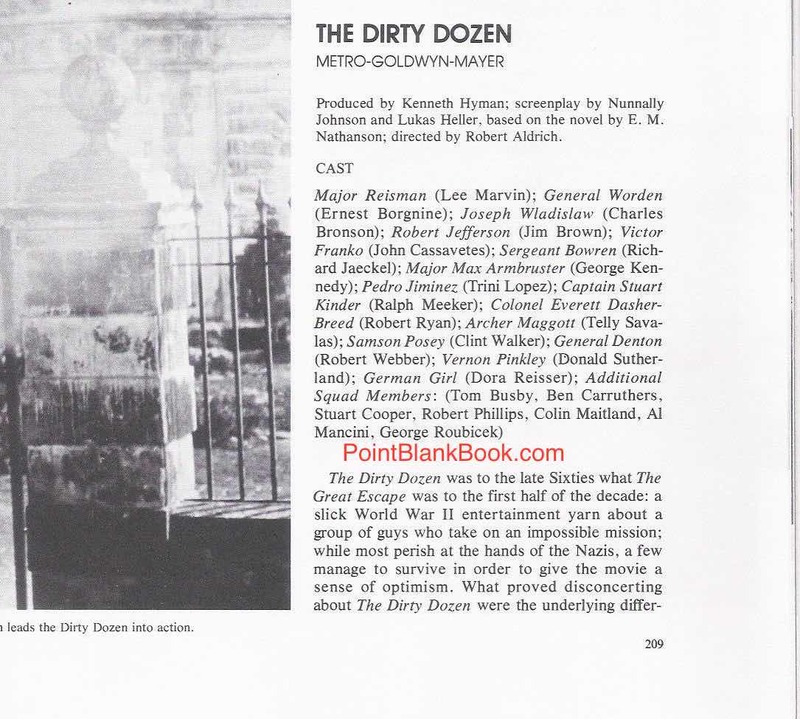 This month being the 50th anniversary of The Dirty Dozen’s release, I invite you read for yourself the essay written on the film’s impact…. 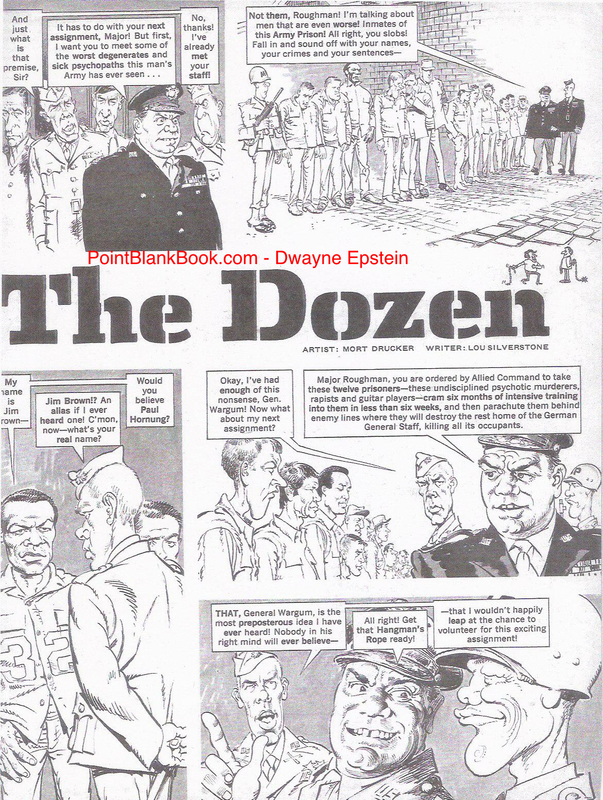 Page 1 of Douglas Brode’s DIRTY DOZEN essay. 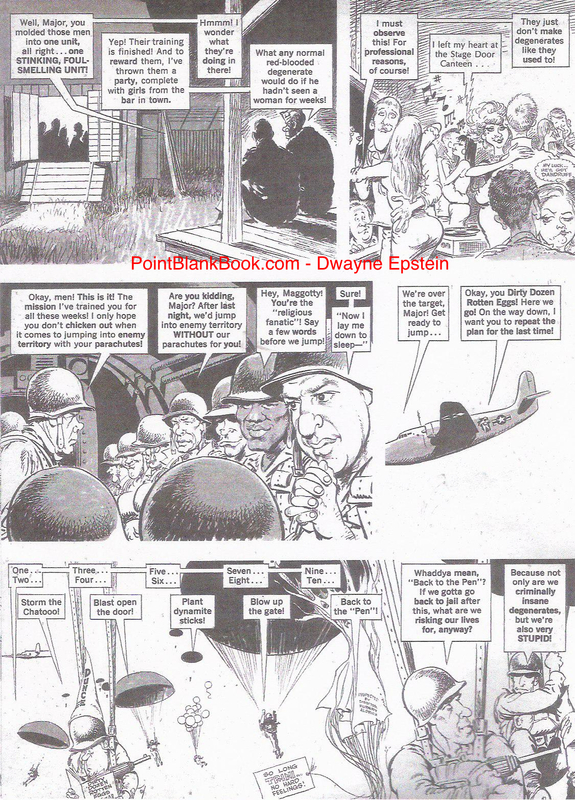 Page 2 of DIRTY DOZEN essay. Conclusion of DIRTY DOZEN essay. 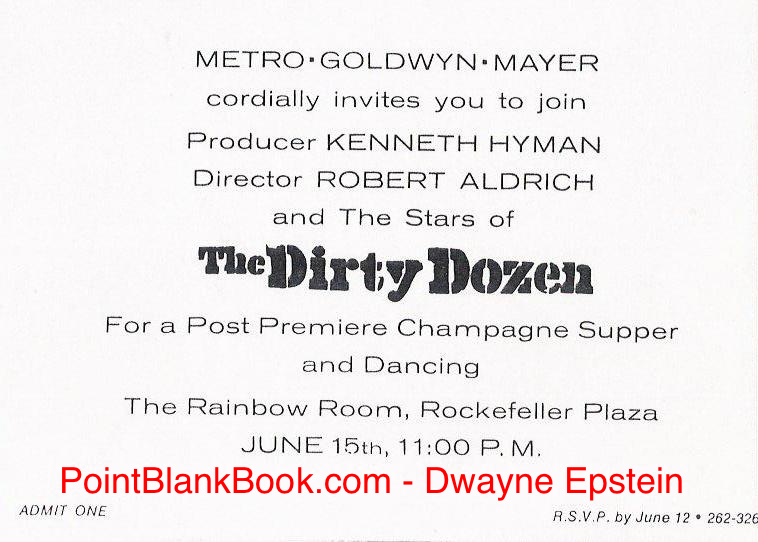 Back in the days when studios did things up BIG, the studio that produced The Dirty Dozen, MGM, planned an old-fashioned formal premeire party with all the trimmings. The studio wasn’t in the greatest financial shape at the time and was understandably nervous about the film’s prospects, never dreaming it would become the biggest hit of the year and one of the highest grossing films in MGM’s history. Relucantly, however, they did send this invite to a select few…. Attendees of this special invitation only soiree received the following souvenir program…..
On the back was the following promotional ad….. 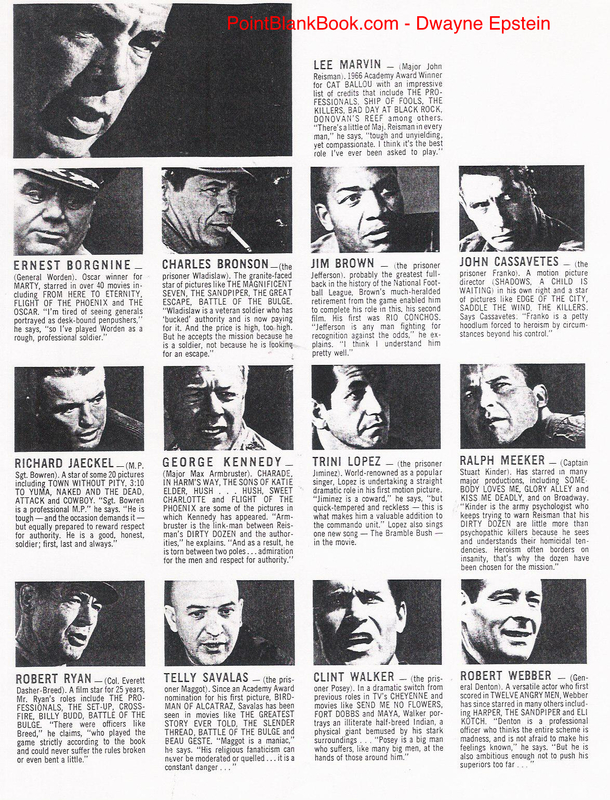 The entire legendary cast was in attendance at the black-tie affair (Ernest Borgnine, Charles Bronson, Jim Brown, John Cassavetes, Richard Jaeckel, George Kennedy, Trini Lopez, Ralph Meeker, Robert Ryan, Telly Savalas, Donald Sutherland, Clint Walker and Robert Webber). For Lee Marvin, who was divorced from his wife Betty (but still in contact with her) and keeping company with Michele Triola, the quandary was who would he take to the event? According to this ragged clip from Cue Magazine, the answer surprised everyone…..